Is your week simply dragging on? You know what would be a fun way to lift your spirits? Rainbow nails! A rare thing, the rainbow – you only see it when it rains and the sun shines, both at the same time. But, if you have it on your nails, you have your very own view all the time! 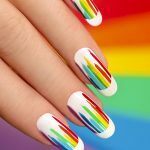 Let’s go ahead and take a look at these rainbow nail arts. 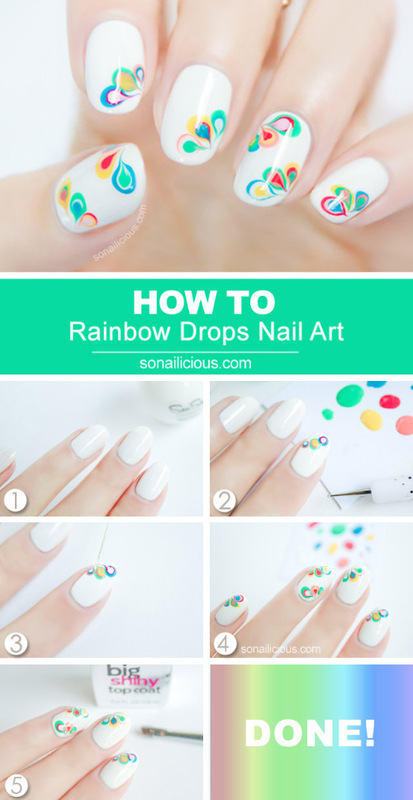 Create a super cute and fun marble effect nail art with the colors of the rainbow. This is an extremely easy design that can be done by even beginners. Paint all your nails white for the base. Place a dot with the largest dotting tool with one color, then follow up with the second largest with another color, then finally the smallest one with the third color. Create three dots like this. Use the needle to pull the dots in one direction as shown. Make sure that you do this while the nail polish is still wet. Repeat this step for all the nails. Don’t forget to seal it with a top coat! When you were a kid, didn’t you wish you could climb up the sky to see a rainbow? If there was a ladder for making the climb, I assume that it would possibly look something like this! Start with white as your base. Now, using the rectangular brush dipped in red polish, create a square in different places as shown. Take the next color and do the same. Keep doing this till you have your rainbow stripe complete. Now, use a nail striper to create a stripe on either side, so that it looks like a ladder. That’s all! Finish off with a top coat, and you’re ready to climb your ladder. This is a good option for the spring time. The usage of pastel colors in the ombre and the floral design together make this nail art extremely pretty! I feel like spring is upon us by just looking at it! Paint your index finger white, ring finger and thumb pastel blue, middle and pinky fingernails pink. Dip a makeup sponge in pastel green and create an ombre on the pastel blue. Do the same on the pink, but this time, use the pastel pink color. 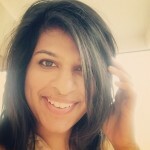 You should have the ombre effect as shown. Use a dotting tool to create rainbow polka dots with all the colors. Dip the dotting tool in pink, and create polka dots. Now, use the toothpick dipped in pastel pink to create texture on the pink dots. These will be the flowers. Add the leaves with the green color and a toothpick. Seal it with a top coat and you have yourself an amazing nail art! This one’s for the artist in you! There’s nothing more satisfying that splattering paint and creating art. That is exactly what is done in this nail art. So, what are you waiting for? Splatter away! Start with a white base. Consider this as your easel. Cut up the straws into 3 pieces so that you don’t waste too many. Dip a piece into some blue paint, and blow from the other side while aiming at your nails. Move on to the next set of colors. Keep doing this till you are satisfied with the outcome. Clean the nail polish from your skin and wait for the polish to dry. Then, apply the top coat and you’re set! What’s a good way to combine science and math? 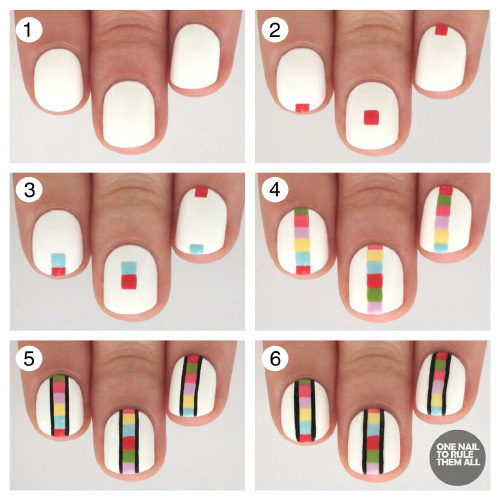 This geometric nail art that showcases all the colors in a spectrum! So the next time someone says you aren’t good at math or science, show them your nails! Apply the white as a base coat. Place two pieces of tape on either side of the nail, as shown. Apply stripes of nail polish in the order of the rainbow onto the makeup sponge. Dab it onto the nails till you are happy with the results. 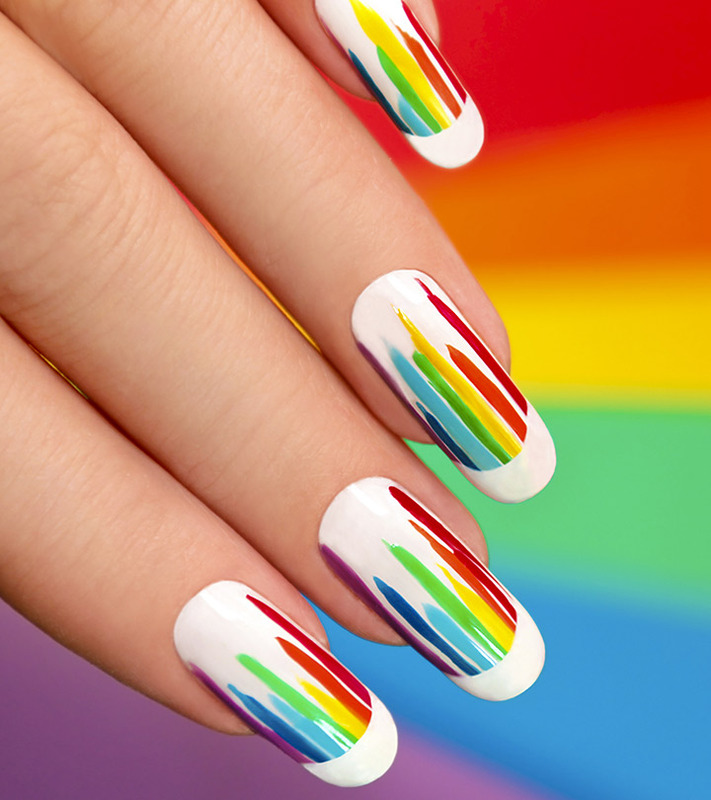 Use a nail striper to create zig zags on the colored rainbow ombre as seen in the image. Seal it with a top coat – it’s as easy as that. This is a great option for Easter, but also just in general if you like pastel rainbow shades. I personally love anything if it is in pastel, so I’m completely sold for this one. It’s really simple to do as well! Start off with white as the base on your nails. 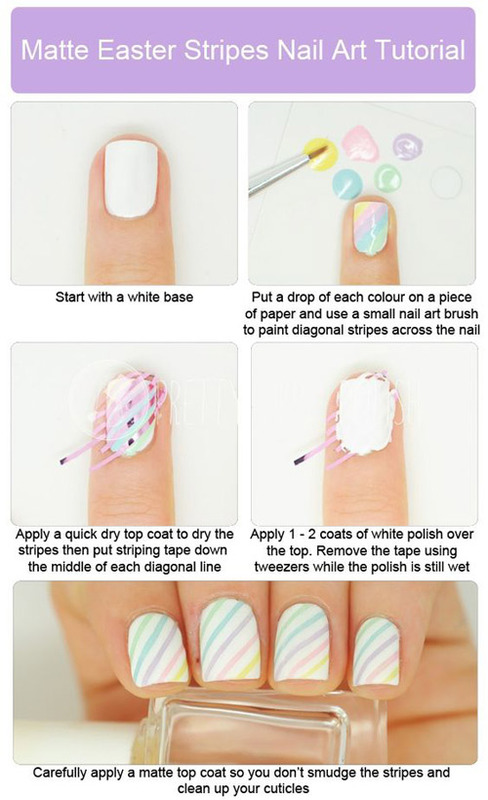 Use the nail striper to create diagonal stripes with all the pastel colors. Once it dries, place the strips of tape along the diagonal lines. Use a white nail polish to paint over it. Carefully remove the tape to reveal the final look. Make sure to finish it with a top coat! Paint the bottom half of your nails pink and the top half blue. Place the zig zag stickers in the middle of each shade. Now, paint the neon green at the top, purple in between, and orange at the bottom. Carefully remove the stickers and seal it with a glitter top coat. If you want, you can go the extra mile and create an accent nail on the ring finger. Who doesn’t love sprinkles? Especially rainbow ones! They look good on everything, cakes, cupcakes, doughnuts, cookies – you name it! I wouldn’t mind having them on my nails, that’s for sure! Various colors of the rainbow for the sprinkles. Paint your nails off white as the base. Think of this as the sugary glaze on the doughnuts! It’s time for the sprinkles now! Use a nail striper dipped in a nail color and create tiny sprinkles on the nail. Do this with the rest of the colors and seal it all with a top coat. Polka dots are always so much fun! If you’re ever having a dull day, all you need to know is look at your confetti-style nail art and I’m sure it’ll pump you right up! Who knew a bunch of colorful dots could make so much of difference? It’s super easy so make sure to try it! Dip a toothpick in blue nail paint and create different sized polka dots. Continue to do this for the other colors. Once that is done and you are happy with how it looks, seal it with a top coat. No nail art tutorial is complete without a version of the French manicure. This is a slight twist on the traditional French manicure. Instead of the white tips, we’ll be going for stripes of colors of the rainbow. Pick a color for each finger, except for the ring fingernail. This one will have all the colors. Paint one thick layer at the tip with the nail striper, as though you were doing a French manicure. Now, create two more lines below that. Do the same with the other colors on the rest of the nails. For the ring finger, however, create curved lines with multiple colors so that they look like a rainbow. There you have it – a rainbow French manicure! Don’t forget to seal it with a top coat! Well, there you have it! The ten best rainbow nail arts. Easy enough, aren’t they? Some of them do require some patience, but it’s totally worth the effort. Now, you no longer have to wait for the rain and the sunshine to see a rainbow!